It used to be complicated, buying the Thinkwalks guides only as in-app purchases through the Know What Essentials guide. That cost $7.97 for both Thinkwalks guides. Now you can get both—Everything Explained and Local Nerd! for just $3.98 and don’t have to work your way through the in-app rigamarole! You can still get the guides the old way, if you want lots of Know What guides: You can purchase any of the other wonderful Know What guides as in-app purchases within either of the Thinkwalks guides. Know What is expanding to more cities from the current SF and LA options, and they’ll be a useful travel guide for those of you wanting more than just Thinkwalks nerdy fare. Also, check out the stunningly beautiful Know What site, where you can learn about the other contributors to the guide. “It’s surprising I’ve lived here this long and didn’t know about that! And that! And that!,” they exclaim. Each app has about 80 locations mapped and described deeply (in 200 words). The Everything Explained app is for newcomers, visitors and the uninitiated. It tells about things like the Freeway Revolt, why we know it’s really John Lennon’s signature, secret views, Rosie the Riveter, the truth about Lillie Coit and other debunkings of common SF myths and mis-remembered landmarks. 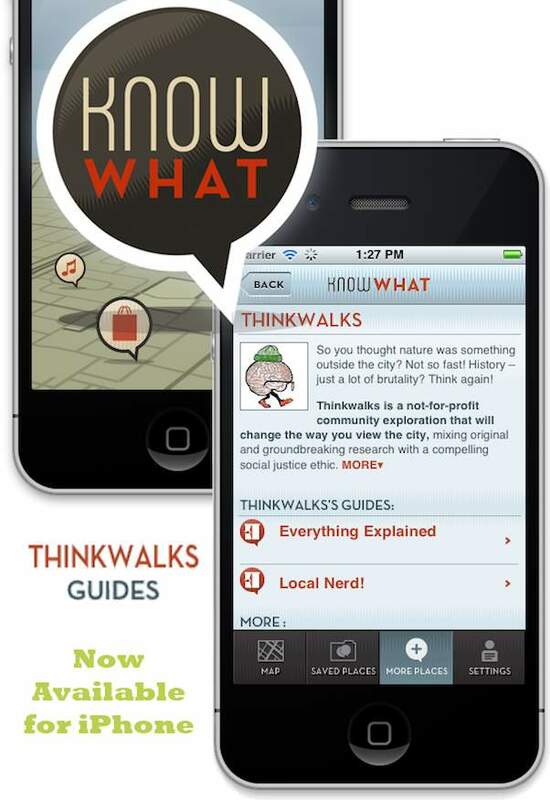 When you’ve graduated from Everything Explained, the deeper Thinkwalks app is Local Nerd! for all you SF Deep Dynamics addicts. This app will satisfy your craving to know how the Panama Canal affected the growth of SF, how rebar concrete developed here, hidden springs, cemeteries, altered landforms, and a handful of resource locations for DIY projects. Now go see the full announcement with authors hilarious caveats and a full list of entries here. Previous article: A Creek Through the Wiggle & Across Market at Church St.